Insights vs MBTI: Am I an Extrovert? Last week I went through our corporate Discovery Insights training. My MBTI preference is ISTP so I was curious what the difference would be after my Insights assessment given both instruments are based on Jungian Theory. My type is ISTP = Introvert, Sensing, Thinking, Perceiving. In a nutshell, my preference is introverted thinking which means I take data in though my senses and internalize before responding. I’m open to change and have little need for details and closed-ended outcomes. Again, this is a preference, not a stereotype or rule. There are 16 types. My temperament, according to David Keirsey’s temperaments is SP or Artisan. Artisan’s are fun loving, creative and unconventional according to Keirsey. I suppose that’s why I did the moonwalk at the enterprise standup today to wake up the monday morning zombies. Seriously, it was awesome. There are 4 temperaments. I’ve done the MBTI assessment 3 times over the last 5 years and it’s been the same every time. Much like DISC, Insights is another interpretation of Jungian Theory. It’s based on separating the introvert/extrovert preference and the thinking/feeling preference into colours. My Insights preference is Yellow (extroverted feeling), Red (extroverted thinking), Green (introverted feeling), Blue (introverted thinking). That makes me “sunshine yellow”! On a side note, my dad’s nickname at work was Grumps. “Grumps” was written on the front of his hard hat. He worked as a boilermaker from the day he graduated high school to the day he retried and yes, he can be one grumpy sumbitch. I have inherited some of that grumpiness so needless to say, I was surprised to see “sunshine yellow” as my preference. The “yellow-red” combination shows an extroverted preference and very much aligns with the SP temperament. The “blue”, being my fourth colour, aligns with the J/P of MBTI. I’m not big on details, like open-ended scenarios and generally tune out when there is too much detail. That said, I like having fun at work, sometimes too much fun and I do wear my heart on my sleeve. It was a riot when we broke into type-like groups which magnified the differences. The difference between MBTI and Insights, for me, was that my MBTI preference and dominant function was introverted thinking whereas “yellow” from Insights is extroverted feeling. Quite different. Again, this is preference, not stereotyping or a rule. Both instruments use core Jungian Theory as far as Attitude ( extrovert/introvert), Functions (sensing/intuition for information processing, thinking/feeling for response) and Lifestyle (perceiving/judging). Both my MBTI profile and my Insights profile were bang on except that my insights profile mentioned I have a large circle of friends and acquaintances which isn’t the case. I prefer alone time to big group time unless I know everyone in the group! I’m not anti-social, I simply like ‘me’ time and I think extroversion is something I’ve actively developed given the type of work I do. Put me in a party and I b-line for people I know, unless it’s my wife’s Zumba party in which case I get jiggy wit it. Now that I’ve been assessed with both instruments, I find that Insights is easier to grok. Colours are easier to remember, although I’ve been studying MBTI as a hobby for a few years so I have a pretty good understanding of it. I liked Insights because we went into details about how each colour reacts under stress. We talked about good days, bad days and how to figure out which “colour preference” others have so you can understand them better. Again, the same as MBTI, it’s not an instrument to label people. The delivery of the Insights material is easier to understand, especially for people like me with less than stellar attention to detail. Colour good. Details bad. The same things that stress out an Artisan also stress out a “sunshine yellow” preference. Forced structure, rules, severe constraints and incompetence. My biggest confusion was the drastic difference in introverted vs extroverted preference. I’m sure that since my MBTI preference resulted in a preference for introversion, I developed a bias towards it, after all, many people are surprised when I tell them I’m an introvert. Maybe I’m not? Ok, I’m rambling now, which is a trait of “sunshine yellow”. We tend to think by talking (an extroverted trait) and we tend to be noisy listeners which is why I often don’t shut up sometimes. We also tend to write smiley faces on stuff and cross out the word “resources” with “people” on sticky notes. I firmly believe understanding whichever Jungian Theory you like best is a key to managing responses to change. All this ‘doing vs being Agile’ crap is just that. Crap. Culture is a collection of the behaviours of the people in the organization and people have natural preferences. Telling people to adopt a mindset that is at odds with their core preference is not likely to work. After all, I am a control freak and its taken years to tone that down. I still have lots of work to do on that front. I doubt I’ll find an organization that will optimize their work to the level I want to, but as an Inspirer (sunshine yellow) success for me is when I inspire people see that there is a better way to work and they find a way to change their crappy organization or change their crappy organization. Thoughtful post. I think the value of all these assessments (and I’m certified in a bunch of them, including MBTI) is to show that, while people are different, we’re different in some predictable ways. When we recognize that other people have patterns that aren’t like our own, we can better understand where they’re coming from. And, when we know our own style (and possible blind spots) we can adjust our own behaviour for more effecive communication and better relationships with the folks who aren’t like us. 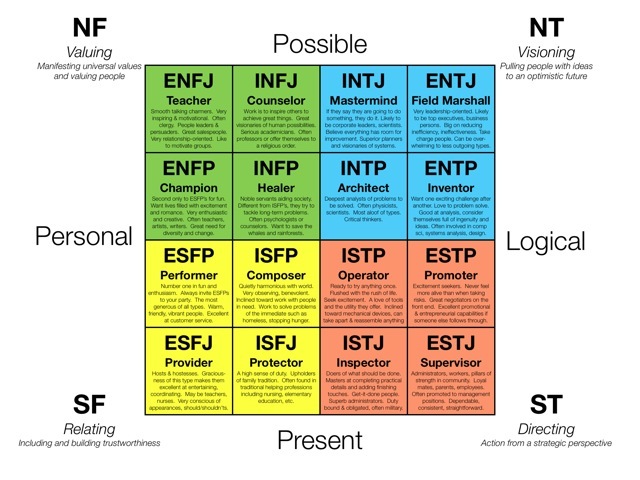 As a Sunshine Yellow, Idealist, ENFJ coachy person, I’m neurologically, socially and professionally wired to see the potential in people and help them achieve it. Alas, they won’t all joyfully jump on the “be your best self and change the world” bandwagon the way we Yellows do. Our gift and challenge is to find ways to help them come to that discovery and desire on their terms. I think anyone of any style can be inspiring in their own way. The genius is when we find ways to inspire people who don’t share our style and help them unlock their own inspiration. That way, we get more people on the path to creating sane, uncrappy organizations. So keep exploring and inspiring. I love your description: “we are all different in predictable ways” you language ninja you! I agree anyone can inspire in their own way, I found it interesting that the Insight session focused on accepting differences and my assessment was opposite of Andrews yet we get along so well. As we were evaluating the ‘colour wheel’ someone reflected back that Andrew was standing still pondering the wheel while I was jumping around and thinking with my mouth! I hope one day we’ll get a chance to work together! I don’t know a thing about Insight, but as a Ti user my self (ENTP), from your case, I suspect that Insight is too bias to the extroverted side. To outside world, especially that I’m an E, all I express to people is more about feeling. My feeling, people feeling. Not in a deep & philosophical way, it’s just for the sake of harmony. Maybe that’s is because my Fe is already developed. Maybe you are too.